Simon and Schuster 2011 (first published in Sweden, 2009). 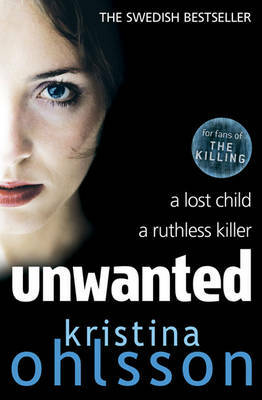 Unwanted is a readable police-procedural set in Stockholm but telling a story that takes the investigators to several Swedish cities and towns, providing for me a distinctive geographical background, as most of the many Swedish crime novels I have read are set in one location. The plot concerns the disappearance of a young child, Lilian, from a crowded train travelling from Gothenberg to Stockholm. Sara, the girl’s mother, has stepped out onto the platform to make a phone call during a 10-minute wait on the train’s route. She has been distracted by a distraught young woman who needed help with her dog, and missed the train when it left. Despite the train guard watching over the little girl until her mother can reach Stockholm by taxi, Lilian goes missing. The team assigned to investigate this case consists of Alex, a legend in his own police force for the number of previous crimes he’s solved; Peder, an ambitious young cop; Fredrika, one of the new breed of graduate entrants; and Erica, who takes phone calls and provides administrative support. Soon they are joined by Mats, a data analyst. Alex and Peder are both extreme sexists who despise Fredrika on various grounds: she’s a woman, a graduate, intelligent, attractive, professional not gushing (over them), and believes in modern policing methods. The two men are quick to dismiss Fredrika’s instinct that the young woman with the dog needs investigation, insisting on trying to find their top suspect, Lilian’s father, who is estranged from Sara, the girl’s mother. A main theme in this book is the awfulness of men. Here, they are portrayed almost universally as physical abusers of women, or mental abusers (both Fredrika and Erica have boyfriends that fit into this category), or they are just awful in general in their personal and professional relationships, like Peder. The author does much to stoke the reader’s anger about all this horrible behaviour, but never really follows through on any of the various plotlines featuring most characters. In contrast, almost all the women are portrayed positively, with the exception of Lilian’s grandmother. I am not sure what to make of this book. It is readable and I enjoyed it. The ongoing investigation, once it gets onto the right track, is involving, particularly when Fredrika is allowed to demonstrate her talents (considerably greater than her male colleagues’). But the subject-matter of the investigation is very distressing, and I felt that the cruel suffering of the victims (the children and their mothers) was rather brushed-over in the interests of the predictable plot (I am sure I am not the only reader who will have worked out long before any of the police what is going on and what simple action therefore needs to be taken to find out the identity of the criminal). At least the crime descriptions are not graphic, but there is not enough emotional depth in the book to convince me that it is a sincere, rather than a commercial, novel. In addition, the ending was disappointing, as several possible clues (a bit clunky in most cases) and outcomes were jettisoned in favour of a “plucked out of the air” solution and a fake-heroic climax. And although there is a brief coda letting the reader know what happens to the police team, their lives are perhaps of less interest to readers than those of some of the victims of the crimes, about whom we learn nothing once their part in the plot is over. Despite my criticism, I do think the author has talent as a storyteller, so I may read her next book to see if it an improvement on some of the less-good aspects of this debut. Other reviews of Unwanted are at: Euro Crime, Fleur Fisher (whose summary: “good but not as good as I had hoped” is one with which I agree), and Salazar. Oh, no, more violence against children and their mothers. I think I may pass on this. I am right now reading Sue Grafton’s latest book, V is for Vengeance. If one wants an easy going, well-written book, with humor and an interesting story without a lot of violence and gore, try this. I was taking a break from Nordics for awhile and this is just the right distraction and perfect for holiday reading. I’m looking forward to that one, too, Kathy. Not out here in the UK yet, but soon. I have not read this one, but I just googled a couple of Danish reviews. The readers seem thrilled but the main newspapers seem to agree with you that this is commercial – ´your typical Swedish femikrimi´. The funny thing is that I have seen the cover very often. For some time my Danish platform has offered Unwanted together with my Danish debut with some sort of discount.